Blizzard considers lowering the cost of entry to the eSports scene. 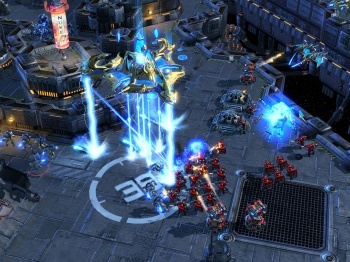 Playing Starcraft 2 competitively comes at a price: the recommended retail price, that is. The eSports scene could do with more aspiring professional gamers these days, and lowering the barriers to entry can help bolster numbers. Blizzard has considered this, and recently revealed there may be a possibility that Starcraft 2's multiplayer component will use the free-to-play model. Dustin Browder, Blizzard's lead designer for the highly popular RTS, was asked about the company's plans for free-to-play in a panel at the Valencia eSports Congress. In response, he said that the company was "looking at free-to-play as an option for the multiplayer", although he admitted afterwards that there were some concerns regarding the logistics involved in moving from a paid product to a free one. "We don't know how we would monetize it," he explained. "While it might be good fun for me to play against someone with only half the units available to them, that's not going to be an enjoyable experience for them." The move to a free-to-play model may not be out of the question, though, since games such as Dota 2 and League of Legends both currently operate on a free-to-play model and also maintain a healthy presence in the eSports scene. At the moment, Starcraft 2 already has a "Starter Edition" that allows people to try out a handful of multiplayer maps for free, but only as a Terran. Given that Blizzard is still working on the release of the Heart of the Swarm and Legacy of the Void expansions, it's likely that the change won't be happening any time soon.